Our SOCK DRIVE continues. Our goal is to collect socks for children in need and help to provide them protection and warmth to their toes/feet. We are asking for warm, colorful, comfy, whimsical and fun socks that may help to bring smiles to the children that receive them. These basic essentials are truly a need for underprivileged children and will be beneficial to protect and warm their toes/feet. 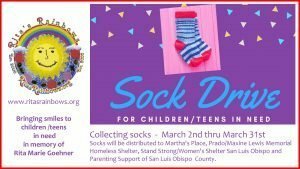 They will be collected, separated by size/age and distributed by volunteers to the agencies that serve children in need including Martha’s Place, Prado/Maxine Lewis Memorial Homeless Shelter, Stand Strong/the Women’s Shelter SLO and Pregnancy and Parenting Support of San Luis Obispo County. This collection will fill a need at the shelters and provide them an inventory to help those children that come in and in need of socks. Cassy Goehner – 805.458.5213 ; email rr@ritasrainbows.org. to make a monetary donation. See below for SPECIAL ANNOUNCEMENT! Together we can help others and celebrate the Magic! Disney Parks and Points of Light collaborate and celebrate family volunteers by rewarding nonprofits with Disney tickets for hosting community projects. Rita’s Rainbows is a member of Points of Lights and we ask that you take a moment to sign up for the Rita’s Rainbows, Sock Drive (https://www.allforgood.org/projects/28gaE9kR). Together we can make a difference in the lives of children – one pair of socks at a time – one smile at a time! We also may receive tickets to Disneyland and include them in our Annual Spring Drawing.